I thought this would be the perfect time to repost our ALL-TIME favorite chili recipe. And, we have tested and tried many, many, many. We just love us some Mexican food 'round here. And, this recipe happens to be one of the most frequently clicked-on posts on this blog. That doesn't surprise me; every time we serve it to friends, it gets rave reviews! Because, folks, it's just DELICIOUS! It's spicy, 'cause that's how we like it, but if you like your food milder, just leave out the jalapenos. One of the things I LOVE about this recipe is its versatility. 1. You can stuff it inside a flour tortilla for a FANTASTIC burrito. Serve with sour cream, salsa, and Mexican rice. 2. You can put it in a casserole dish and top it with cheese for an amazing dip. Serve with tortilla chips. (We always do this with the leftovers). 3. It's a huge timesaver. The original recipe came from a freeze-ahead cookbook - so make a double (or triple) batch, and put the rest in freezer bags. Pull out a bag anytime you need a quick dinner or an appetizer dip to bring to a party! I LOVE recipes like this one - versatile AND delicious! In a large crockpot, combine all ingredients and set crockpot to low. Simmer for 5 to 6 hours. If using the stovetop, combine all ingredients in a large stockpot. Simmer the chili on low for 2 to 3 hours, stirring often, until thickened. Serve topped with Mexican blend cheese and sour cream, if desired. To make a layered Chili Dip: Combine 4 ounces of softened cream cheese and 4 ounces of sour cream in a small bowl. Spread in the bottom of an 8" x 8" baking dish and top with leftover chili. Top with shredded cheese. Cover with foil and store in refrigerator or freezer. When ready to eat, bring to room temperature and bake at 350 degrees for 20 minutes, or until cheese is melted and chili is heated through. Serve with tortilla chips. That sounds like a wonderful recipe, especially for this time of year. Yum! I'm always looking for new recipes to make in my crock pot so thanks for sharing. Mmmmm, I love chili, I'l have to give this one a try. Wow - that looks fabulous, and soooo easy. How did I miss that the first time you posted it? Elizabeth loves spicy food (like her parents, and aunts and uncles and cousins!) and she'll probably go nuts over it with the corn and black beans especially. And it's great that it uses chicken instead of beef, since we have to go easy on the beef in this family. I'm going to CA this weekend, but I'll be making it the first day I get back!! Thanks for a great post. I'll check out the link to the other stuff, too. This looks DELICIOUS, Sar. It's definitely going on the menu with our next grocery trip!!! I love how every recipe you post has been "slightly adapted" in my mind, that means you are a super start, for real cook. I will give it a try, you haven't steered me wrong yet with a recipe of yours that I've tried...and I've tried several that you've posted. Winter is in the air! :) Yummy warm dish indeed! Oh, yum. Must. Make. This. yummy! i might make this as a dip saturday night for our neighbors costume party. it looks wonderful. This looks delicious and since it's from you I'm sure it is. Thanks! so who are the winners of your giveaway?!?!? This one tops my list of recipes to make SOON! I can't wait to get to the grocery! I'm so glad to "meet" you! 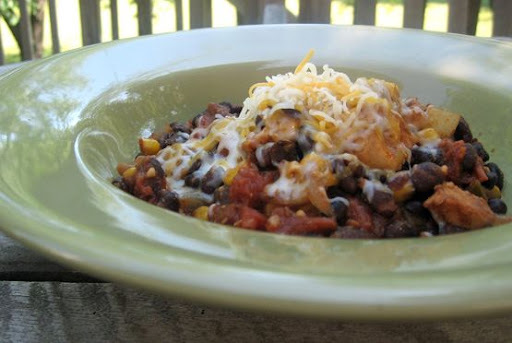 I'm looking forward to coming back to your blog...maybe over a bowl of this delicious chili!